What an exciting time for B2B marketers! Purchase decision processes are shifting to an area where you are front and center and can create tremendous revenue impact. Technology innovations are abuzz, and the next stage of best practice is being born right before our eyes! 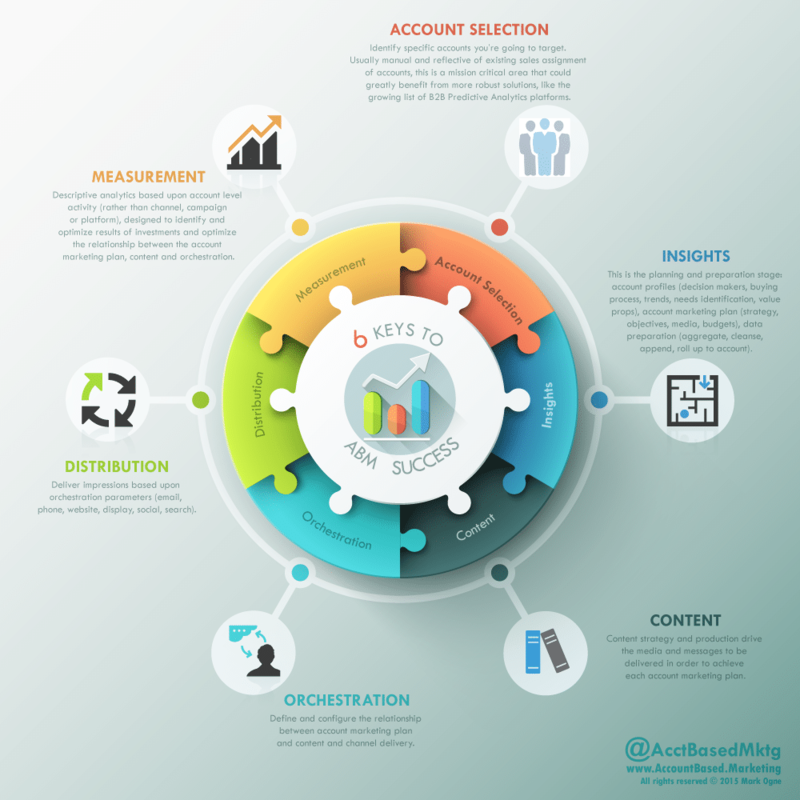 In all of this, Account Based Marketing has taken front stage and for a tremendous reason. Account Based Marketing holds the potential to focus sales and marketing efforts jointly towards the highest value targets, to focus on engagement that leads to revenue impact. This is the path where organizations realize the fact that engaged sales pursuit is occurring later in the process of purchasing and they empower their marketing organizations to fill the growing needs of buying teams to assuage their desire to research, learn and evaluate the issues they're trying to solve. The great news is that B2B marketers share a common thread, a desire to learn, expand, collaborate and succeed. Tapping this spirit of success, the development of best practice and new enabling tools will provide a fertile environment for major advancements. A lot of the dialog around ABM is altogether too narrow and mistaken. Definitions are nice, but they don't apply to wide enough to be useful. Those who say that this practice is just like marketing of a long time ago miss the point that "accounts" buy nothing, people at those accounts make purchase decisions and the process of making those decisions is changed radically in the last two decades. The fundamental shift brought by ABM is the strategic focus from “people” to “accounts” to “people at accounts" (Buyers). People: For the last decade and a half, strategies have been honed around inbound marketing and marketing automation. Inbound lead acquisition is a foundational aspect of marketing. It’s a great sign that people are interested in an offering and take the time and effort to engage with these programs. Being able to stimulate this demand, recognize it, and nurture these interests was a digital monumental achievement... one that was more relevant in the pre-Internet era where an economic buyer would entertain the top dozen or so vendors in the all too famous "dog and pony show" demo. Accounts: The first wave of ABM dialog was geared towards a singular focus on selecting a list of target accounts and delivering more messages through more channels. The objective was to garner as much response, or engagement, from each account as one can muster. In a large sense, this approach focused on the benefits of spend efficiency, promoting the idea of delivering a larger volume of media towards a smaller, defined audience. Once an arbitrary volume of website visits or clicks occurred, marketers would puff up their chest and claim marketing qualification. And, somehow, this series of clicks would allow them to claim attribution. The reality is that this approach has no rational bearing on revenue generation and probably does more to negatively impact relationships with the C Team and Sales leaders. I wrote about this idea in an article on ABM In Action, "ABM’s Vanity Metric: Engagement". Buyers at Accounts: With the introduction of the SiriusDecisions Demand Unit and the CEB Buying Group, the buying function within each target account has been brought to the proper elevation. A key point, there’s been a gap between marketing actions and the reality of the desired target… the buying entity, a very defined group of people who make purchase decisions. Collecting individual leads and targeting anonymously "at" target accounts misses the point that the objective of marketing is to influence and engage this smaller group of people and that more engagement may or may not be relevant to closing more revenue at an account. Think of it this way... salespeople don't sell accounts, they sell to people at those accounts. Invariably, when you ask a rep about an account, the first thing that comes to their mind is the name and face of people. Why? It's simple, accounts don't purchase things or make decisions, people do. Yes, we have a definition of Account Based Marketing. We even have primary research to help you create "High-Performance ABM™" within your own organization. Define what you want from ABM, what are your KPI's? Develop a rational, data-driven means to identify target accounts. Develop a means to segment those target accounts into groups that share common thought processes and needs. Before buying technology, isolate a couple of your segments and create a pilot using your existing tools to control messaging, and test response.